In their pre-release interviews, the makers of “Talvar” have emphasized a point over and over again – that their film is an impartial attempt at reconstructing the murder of a teenager and a servant in suburban Delhi. Let’s get one thing out of the way. Director Meghna Gulzar and writer-producer Vishal Bhardwaj are taking sides. Their slant, like an errant slip, shows right from the first few scenes and becomes more prominent towards the conclusion. It is the only thing that leaves a bitter aftertaste in this otherwise well-constructed, gripping film. Neeraj Kabi and Konkona Sen Sharma play Nutan and Ramesh Tandon, doctors whose daughter Shruti is found dead with her throat spliced open. The police arrive at a house swarming with relatives and curious neighbours, and proceed with all the caution of a bull in a china shop. The local police and their haphazard handling of the case has been well documented and Gulzar drives home the point well, making the police officers as stereotypical as possible – pot-bellied, tobacco-chewing specimens who don’t know the basics of criminal investigation. So when Irrfan Khan (as investigator Ashwin Kumar) arrives on the scene, as a taciturn CDI officer (the movie version of the CBI, India’s central investigating agency), the contrast between him and the bumbling police force handling the case earlier is evident. He is clearly the hero of the film – the man entrusted with the task of finding the truth and wiping off the rust from the scales of justice, as another character tells him. As Kumar and his subordinate Vedant (played by Sohum Shah) revisit the crime, they find many loopholes in the investigation, but to Gulzar’s credit, she handles this with a light hand, injecting the proceedings with dry humour and smart repartee. The crime is told entirely from the point of view of the investigators and we never get a sense of what Nutan and Ramesh are feeling or going through. We see them from behind the viewing glass, always at a distance. But even from that distance, Gulzar and Bhardwaj paint them as innocent, taking their version at face value, while always questioning the other side. As investigator after investigator ploughs through technical evidence, multitudes of tests and testimonies, “Talvar” does a good job of cutting it all out and keeping the entire process of deconstructing a crime interesting. Like Chaitanya Tamhane’s “Court“, “Talvar” deals with the flaws in India’s criminal justice system and how it is often governed by the prejudices and limitations of the people running it. Irrfan Khan is easily the scene-stealer, going about his role with the practised ease of an artist who knows how good he is. Gajraj Rao as Dhaniram, the first police officer in the case, gives him good competition in the acting department, but both Konkona Sen Sharma and Neeraj Kabi are subpar. Kabi especially seems almost catatonic in some scenes. Their stilted characterisation might be so because the parents are secondary characters in this film. The real story is that of those investigating this crime, so it is only fair that they get prime space. The other star of the film is Vishal Bhardwaj’s script, one that tracks the case without ever getting voyeuristic or sensational. The casting, by Honey Trehan, is also spot-on and even peripheral characters seem completely part of the surroundings. 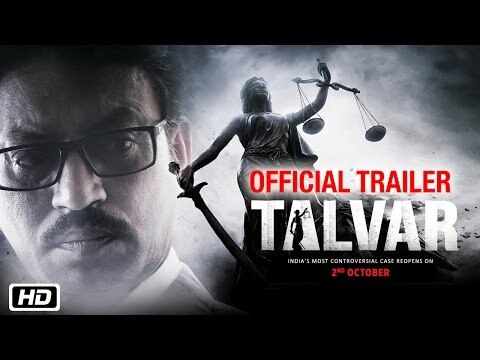 There are lot of things that “Talvar” gets right in the cinema department, but where it falters is in the morality of making a film like this. Nupur and Rajesh Talwar have been convicted of murdering their daughter and their appeal against the verdict is yet to be heard. The filmmakers are careful not to mention their names anywhere, but the publicity material has made it clear that “Talvar” tells the story of the Talwars. In one scene, a police officer tells his juniors that they must not be emotionally involved with their cases. Keep a distance, he tells them. For all its positives, “Talvar” fails to keep that distance, and therefore compromises its ability to be an impartial, unbiased chronicle of what is India’s most sensational murder case.